Vera Schaufeld MBE, formerly Vera Lowyova, was saved by a man who refused to stand by, Sir Nicholas Winton. She was born in Prague in 1930. In May 1939, following the Nazi invasion of Czechoslovakia, Vera was told that she must move to England on her own. She was only nine years old. I remember sitting on Liverpool Street station in London, hearing announcements in a strange language, seeing children all round me being collected and fearing that I would be left there alone. Vera had a lovely childhood growing up in a town called Klatovy in south-west Bohemia, Czechoslovakia (now in the Czech Republic). Her father, Eugene, was a lawyer and a prominent figure within the Jewish community. Vera’s mother, Elsa, was the first woman in her town to become a doctor. Klatovy was a small but progressive place. 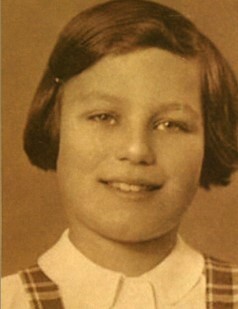 Growing up, Vera never experienced or witnessed any forms of antisemitism. She remembers her childhood as being very happy. She was an only child and felt loved by her parents and her grandmother, who had moved from Germany to live with the family in 1934. At school Vera had many friends, both Jewish and Christian. Despite being one of the few Jewish children in the local primary school, Vera was hardly aware of being a minority and it was not until the Germans invaded Czechoslovakia in March 1938 that she understood what this meant. One day, after school, Vera’s mother surprised her by taking her to a small park. She was told that she must go to England on her own. Trying to reassure her, Vera’s mother said that she and Vera’s father would try to join her in England as soon as they possibly could. When Vera arrived at Prague station, she was devastated to be told that the parents of all the children were not allowed onto the platform to say goodbye. ‘My last sight of my parents was as they stood behind the barrier, waving their handkerchiefs, while I looked at them out of the train window,’ she said. This would be the last time Vera would see either of her parents. Vera’s memory of arriving in England was sitting at Liverpool Street Station, surrounded by other children who had also been saved by Sir Nicholas Winton, fearing that she would not be collected by anyone. A Christian family agreed to take Vera into their home. They were called Leonard and Nancy Faires. Their daughter, Betty, was three years older than Vera and Vera remembers her as being very kind – kind enough to share her pocket money! Before the war broke out on 3 September 1939, Vera’s parents would send her presents and they were even able to speak to her on the telephone. After the declaration of war, however, Vera had no further news of her parents. On 7 May 1945, Vera’s English lesson was interrupted by an announcement that the war in Europe was over. Vera was ecstatic. She remembers thinking: ‘This is wonderful. 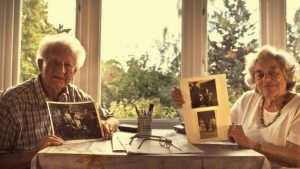 I shall see my family and friends soon.’ It was after a trip to the cinema where Vera saw images from the concentration camps that she learnt no one in her family had survived. Due to the time Vera spent in England, she had had very little contact with other Jewish people. For this reason, she decided to travel to Israel to spend a year working on a kibbutz (a communal settlement in Israel). Here she met Avram, who had survived Auschwitz and Buchenwald. Vera and Avram were married in 1952 – you can see them in this photo, which featured in 2015 as one of HMDT’s Moving Portraits. Before moving to Israel, Vera had trained to be an English teacher and when she returned to England, with Avram, she continued to work as a teacher. In 1972, Vera took the decision to use her experience of learning English as a child in order to teach English to a group of Ugandan and Kenyan children, who had recently arrived in Brent, London. Most of the children were of Asian descent and had been expelled from Uganda by Idi Amin – the then President of Uganda. Amin had given all members of the Asian community living in Uganda in 1972 90 days to leave the country. Many members of the community sought refuge in the United Kingdom. Evidently, experience of being a refugee during the war had shaped Vera’s life choices. It was 50 years after her journey to England that Vera knew of Nicholas Winton and the role that he had had in saving her life. In 1988 Vera was invited to participate in Esther Rantzen’s television programme That’s Life!, where she met other children, now adults, who had been saved by Winton. Following this, Vera developed a lifelong friendship with Nicholas and his wife Grete. Vera works closely with the Holocaust Memorial Day Trust to share her story and to ensure that the future generations will preserve the memory of the Holocaust. Read the life story of Vera’s saviour, Sir Nicholas Winton here.